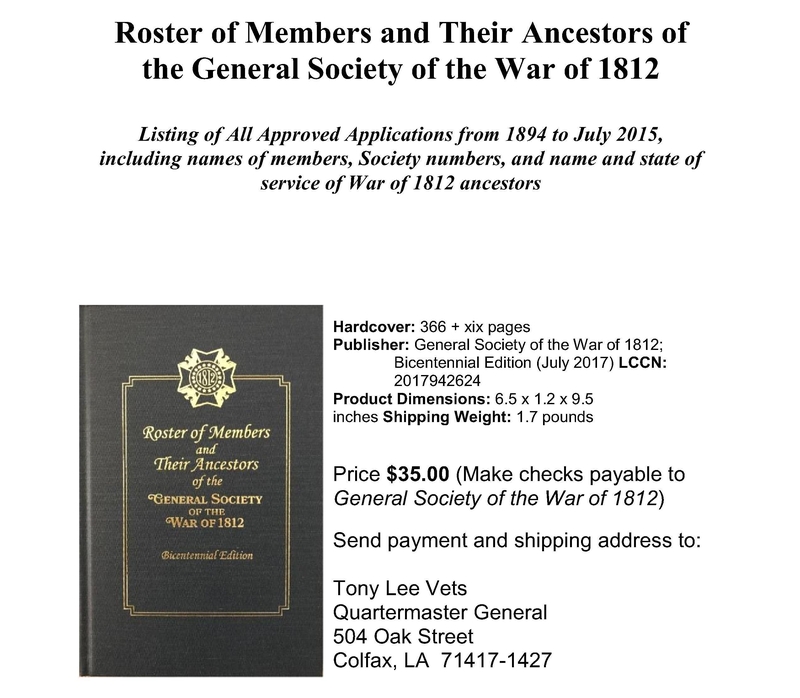 The General Society of the War of 1812 depends upon our members for the continued existence of the organization. Our Society is a patriotic, hereditary organization and like most other societies, we have established various insignia for our members’ use. By proper display of insignia, our members inform the public of our continued presence. The rules for the proper usage of insignia vary among the different societies in this country. Customs also differ between countries around the world. Correct usage even varies between the military and naval services of our country. Each society has come to establish an accepted pattern of what the organization considers the correct usage of the insignia of that society. We have set forth what has become the prevailing practice of the officers and members of The General Society of the War of 1812. All members are requested to conform to the guidelines listed below. In so doing, we will bring credit to both our Society and ourselves. Badges The General Society of the War of 1812 has made two types of badges available to our members: a standard (or full size) badge and a miniature badge. The guidelines apply whether the membership badge in question is standard or miniature. It should be noted that when more than one badge is worn, all must be of the same size; standard and miniature badges are not aligned together. (This restriction does not apply to neck ribbon insignia, which are always standard size and are worn independently of other insignia). Standard The standard or full sized membership badge may be worn with informal clothing such as a business suit or a blazer and is mounted on the jacket. The badge is worn on the left breast above the pocket and centered upon it. If more than one standard badge is displayed, the badge of the most senior organization, by date of founding, is mounted toward the wearer’s right. The top edge of all badges should be on an even line. No more than three standard badges should be worn simultaneously. The standard membership badge is also appropriate for use upon a cut-away or military uniform. The regulations of the appropriate branch of service govern the permission and proper placement of the badge when it is placed upon a military uniform. The standard membership badge is never worn with any type of miniature badge except on occasions when the standard badge is suspended from the neck. The standard badge may be displayed on an outer garment during inclement weather for identification. A standard badge is always worn mounted upon its ribbon bar on the left breast of member of the Society. Chapter Presidents and Past Chapter Presidents (in State Societies with Chapters), State Society Presidents, Past State Society Presidents, and all past and present General Society Officers may war the standard membership badge around their necks suspended from the official society neck ribbon. When worn with formal evening attire, the badge is to be drawn up close below the knot of the bow tie. Miniature The miniature membership badge is always worn on formal ceremonial occasions and should be in one horizontal line with other miniature badges on the left lapel or breast of the coat. To assure proper alignment, the badges should be mounted on a single bar. This bar should never be longer than the distance between the fold of the left lapel of the coat and the left armhole seam. The badges may be overlapped on the left edges to conserve space if necessary. More than one row of badges may be worn. This decision is a matter of personal taste. Sash The President General, Past Presidents General, and other General officers may wear our four-inch wide sash while they are in office. All General Officers Emeritus may also use the “broad” sash. All current and past state society presidents may wear a two and three quarter inch wide sash. Both sashes extend over the right shoulder diagonally to the left hip. A society membership badge may be displayed upon the rosette of the sash at the wearer’s pleasure. With full evening dress, the sash is worn under the coat and over the waistcoat. With formal wear (cut-away coat), the sash is similarly worn. With uniforms, the sash is worn over the coat. The sash is not worn with a dinner jacket, business suit, or jacket. Rosette The rosette is a round insignia covered with cloth worn only in the left buttonhole of a member’s blazer or suit coat. The insignia is used individually; it is never used with a rosette of another organization. It should be displayed only on informal clothing. It is never used with a dinner jacket or full evening dress. During inclement weather on occasions of ceremony, it may be placed on the lapel of an overcoat for identification. President General’s Plaque The President Generals’ Plaque is used by the President General, Past Presidents General, and Honorary Presidents General. This insignia is a large silver sunburst approximately three and one quarter inches in diameter displaying a standard size membership badge of the society. It is placed upon either formal or informal clothing mounted on the jacket below and slightly to the left of the breast pocket. The wearer determines the appropriate use of this insignia. President General’s Star The President General, all Past Presidents General, and Honorary Presidents General may also use the President General’s Star. This insignia is a smaller version of the President General’s plaque. This insignia is a standard size membership badge mounted upon a sunburst of approximately two and one quarter inches in diameter. It is suspended from a standard society neck ribbon and worn at the throat or pinned to a coat like the President General’s Plaque. It is correct with both formal and informal attire. The wearer decides the appropriateness of use. State President’s Star An incumbent State President, all Past State Presidents, and Honorary State Presidents may use the State President’s Star. This insignia is a miniature size membership badge mounted upon a sunburst of approximately XXXXXXX inches in diameter. It is suspended from a standard society neck ribbon and worn at the throat or pinned to a coat. It is correct with both formal and informal attire. The wearer decides the appropriateness of use. Blazer Patch The official blazer patch is correctly worn only on a suit coat or blazer. It is mounted on the pocket on the left side of the coat. Only the pocket patch of one organization is displayed at a time. It is never worn with that of any other society. This insignia is never used with either “black” or “white” tie attire, nor is it used on headgear or outerwear. Ties The Society neckties are correctly used as any other neckties. Cummerbund The Society has its own style of cummerbund which may or may not be worn at formal events. Cuff-links Special cuff-links designed with the Society insignia are available for use at formal events. A cuff-link style is also be available featuring the Society seal. Dress Evening attire (dinner jacket or full evening dress) is customarily worn on all formal occasions. Attire for formal or informal occasions follows the dictates of good taste and social usage. Insignia and Decorations for Gentlemen It is recommended that the insignia and decorations of the General Society of the War of 1812 be worn as prescribed below in keeping with customs and tradition. Members Use rosettes, blazer patches, society ties, as well as standard and miniature membership badges as set forth above. Chapter Presidents and Past Chapter Presidents (in State Societies that have Chapters) Use rosettes, blazer patches, society ties, as well as standard and miniature membership badges as set forth above. They may also wear the General Society standard membership badge suspended from the neck ribbon of the society. State Society officers excepting Presidents and Past Presidents Use rosettes, blazer patches, society ties, as well as standard and miniature membership badges as set forth above in members section. State Society Presidents and State Society Past Presidents Use rosettes, blazer patches, society ties, as well as standard and miniature membership badges as set forth above. They may also wear the General Society standard membership badge suspended from the neck ribbon of the society or the State President’s Star as prescribed. A State Society President or Past State Society President may wear the narrow sash. General Officers Use rosettes, blazer patches, society ties, as well as standard and miniature membership badges as set forth above. They may also wear the General Society standard membership badge suspended from the neck ribbon of the society. All General Society Officers and Emeritus Officers may also wear the broad sash. President General, Past Presidents General and Honorary Presidents General Use rosettes, blazer patches, society ties, as well as standard and miniature membership badges as set forth above. They may wear the President General’s Plaque or the President General’s Star as prescribed and all other insignia at their discretion. In 1890, resolved by the Senate and House of Representatives, that the distinctive badges adopted by military societies of men who served in the armies and navies of the United States in the War of the Revolution, the War of 1812, the Mexican War, and the War of the Rebellion, respectively, may be worn upon all occasions of ceremony by officers and enlisted men of the Army and Navy of the United States who are members of said organization in their own right. (a) A member of the Army, Navy, Air Force, or Marine Corps who is a member of a military society originally composed of men who served in an armed force of the United States during the Revolutionary War, the War of 1812, the Mexican War, the Civil War, the Spanish-American War, the Philippine insurrection, or the Chinese relief Expedition of 1900, may wear, on occasions of ceremony, the distinctive badges adopted by that society.